Why should I use Dockside Marine Repair vs. a dealer or another boat repair facility? 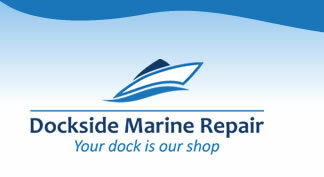 Dockside Marine Repair comes to your boat instead of you bringing your boat to the shop, saving you time. Also at DMR we only replace the parts your boat needs instead of just replacing parts no matter if they are worn out or not, saving you money. Our labor rate is less than most other shops. YES! Winterizing your boat protects the engine from freeze damage. Winterizing also protects your fuel system and vital electrical components from corrosion, as well as preventing rust pits in the engine cylinders. One failure caused by lack of winterizing will cost far more than the actual cost to winterize your boat. How come Dockside Marine Repair only uses synthetic engine oil instead of offering both regular oil and synthetic? Synthetic oil molecules are closed cell molecules preventing water from being absorbed by the oil. Synthetic oil also lubricates much better, and provides far superior protection. We use synthetic oil in all of our own vehicles because we know how much better it is for an engine, therefore we want your engine to receive the very best we can offer as well. How often does my boat need a tune-up? The life of tune-up parts in a marine engine varies considerably due to use, where the boat is kept, where it is stored, and how it is used. Tune-up parts only need to be replaced when they are either worn or corroded. We inspect tune-up parts, and only replace those that are in need of replacement. Most boat manufactures recommend changing you engine oil every 50 hours of operation or once a season, whichever occurs first. Since we use synthetic engine oil we only recommend changing your boat’s engine oil once at the beginning of every season. Most raw water impellers need to be checked every 100 hours or 3 seasons, unless the engine starts running warmer than usual.